Featuring the new work of flamenco dance artist Rosanna Terrracciano with guitarist David Matyas, My Flamenco is a personal reflection of what flamenco means to this local dancer, producer and teacher. Putting Calgary in the spotlight, My Flamenco examines the city that has shaped Rosannas unique artistry, and the culture and people from which she continues to draw inspiration from while so far from the birthplace of this gypsy dance form - Spain. 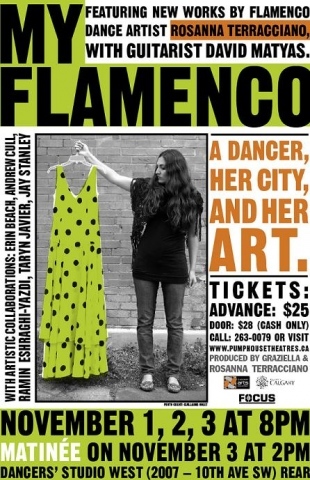 My Flamenco showcases thought-provoking artistic collaborations with Erin Beach (cello), Andrew Cull (percussion), Ramin Eshraghi-Yazdi (video), Taryn Javier (contemporary dance) and Jay Stanley (trombone). My Flamenco gratefully acknowledges the support of Calgary Arts Development and the Focus Corporation in the funding of this project.